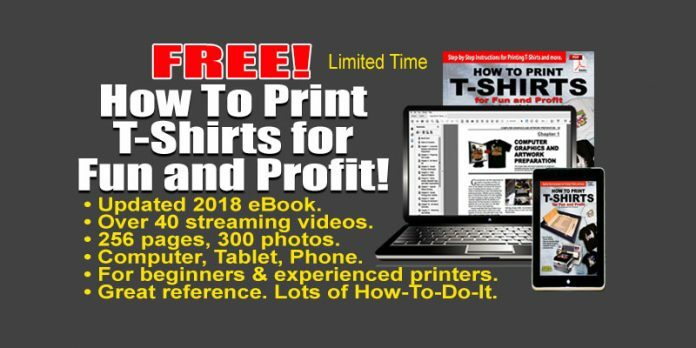 Home Featured Home How to Print T-Shirts eBook! FREE! For a limited time this eBook is FREE! We just updated our very popular book How To Print T-Shirts for Fun and Profit as an eBook (interactive PDF). It has over 256 pages with over 40 streaming videos plus a lot more. You can read the book and watch the videos on your computer, tablet or smart phone. Easy! A thing of beauty. Learn more and get your FREE copy at our Store HERE. Simply use Coupon Code HTPFREE when you check out and the invoice will be set to zero and you will get an immediate download link. Next articleOnline T-Shirt Screen Printing Master Class. Check it out!